I listen to A LOT of podcasts. There is a mountain of quality content out there - and you simply can't beat the price! Most of what I listen to is related to Financial Planning, where all roads have some sort of route to Michael Kitces and the extraordinary media juggernaut he has built. 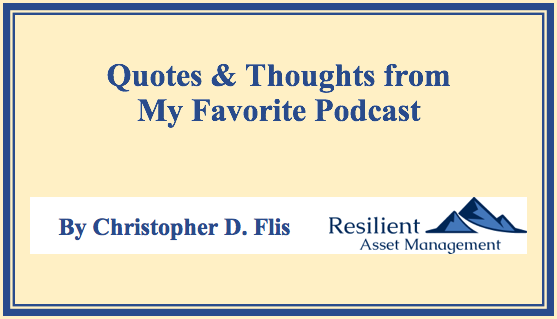 Other podcasts I take in usually center around some aspect of finance. Recently, I happened across Tim Ferriss' interview with Howard Marks...boy was I lucky! Mr. Marks has earned his stripes as a distressed security investor at Oak Tree Capital Management where his firm manages over $122 Billion in assets, according to their website. I am a frequent reader of all he his writing, which includes his quarterly report and his outstanding book, The Most Important Thing, which he recently followed up with Mastering the Market Cycle. Summing up Mr. Marks: he is an investing icon - by any objective standard. While I do not directly invest in the types of securities in which Oak Tree specializes, Mr. Marks provides, both through his books and his quarterly memos, pillars of an investment philosophy which investors of any stripe can adapt to his/her specialty. The principles he illustrates are indeed timeless. For this article, I thought I would quote some of the podcast and adapt it to the Financial Planning space. For anyone, I strongly recommend listening to the entire podcast, which you will find here. Source (The Tim Ferriss Show website). “You can’t predict. You can prepare.” - Howard Marks (Source: The Tim Ferriss Show website). Financial Media provides a daily source of the current "state" of many things - markets, the economy, trade, political impacts on the markets, and a whole host of other opinions about where we are and where we are going. Depending on what you watch and in what order, you can experience the full spectrum of human emotion. At the end of the day, predictions and current interpretations of obscure data points are, on the whole, useless. If you do all these things, then you will be prepared for the known unknowns inevitably lying in wait. Moreover, you will be ready to play offense when others are panicking as market-related vicissitudes will not impact you as they do others who are unprepared. “We never know where we’re going, but we sure as hell ought to know where we are.” - Howard Marks (Source: The Tim Ferriss Show website). While predictions are not very useful, assessing where you are today, is essential. For Financial Planning, that means taking inventory of your current financial affairs and putting first things first. For example, I sometimes speak to prospects who want to direct the conversation toward investments and my opinion of Amazon vs. Facebook vs. Google. This is perhaps a conversation worth having, though not one to pursue if you don't have a Will, or Insurance to protect your family after an unexpected passing, or are battling Credit Card debt. The other angle to this quote is to shape expectations about what a Financial Professional can and can't do. Specifically, today (October 2018), it is unreasonable for anyone to expect the market returns for the next 10 years to look anything like the last 10...the current asset valuations across all markets don't support that conclusion. Knowing that, the Financial Professional and Client can map out a more realistic range of investment outcomes and fold them into the Financial Plan. "...it is when the knives are falling that people are most terrified and the best bargains are available." - Howard Marks (Source: The Tim Ferriss Show website). For those accumulating money, i.e. those in their pre-retirement years, downward market volatility is your friend. With nearly every item - groceries, cars, homes, etc. - lower prices are very welcome. With financial assets - stocks in particular - lower prices stoke fear when in fact they should cause you to consider hitting the "Buy" button. Obviously, looking at lower account balances can be gut-wrenching, especially if one of your commitments is falling while the general market is rising. However, for those not in need of funds, intermediate values are of little to no consequence to you. For a case study in staying the course and the benefits provided by doing so, please read this. "We have to think about the world as a probability distribution." - Howard Marks (Source: The Tim Ferriss Show website). When considering any course of action, it is smart to consider a range of possible outcomes instead of focusing on one specific outcome and only planning for it. A practical example is the backpack my wife packs with items for my 2 year-old son prior to us stepping on a plane. It is a cornucopia of answers to hundreds of "What if" questions that never occur(ed) to me! For anyone with children, my solution of bottle, diaper, and a toy simply won't work, I think. For Financial Planning, I think this quote is directly applicable to Long-Term Care planning. The host of unknowns here fit into a normal distribution of potential outcomes. Applying these potentialities to your personal situation will assist in developing an executable Long-Term Care plan for you and your family...there are many tools to assist with this endeavor - ignoring and avoiding, sadly, are not among them. "There is no rule that will ever work in every case." - Howard Marks (Source: The Tim Ferriss Show website). Mathematics is an ordered system that lends itself to specific rules. 2 + 2 = 4...you aren't going to find many reputable people trying to claim a different result. Basic parts of Chemistry and Physics are the same...E = mc2 being an example of a rule. The Stock Market, conversely, is a complex system, which does not lend itself to "constants" and simple to calculate equations like the harder sciences do. The complexity comes from the interplay of many factors: competition, regulation, political overtones, human emotions, etc. Therefore, for any algorithm, including ones for which Nobel Prizes have been awarded, there are conditions where the equations will not work out as expected. For a primary example, read up on the failure of Long Term Capital Management, where Nobel Prize winners learned the hard way that a bunch of Greek symbols multiplied by zero was, in fact, zero. The application here for Financial Planning is to be aware of the markets in which you are invested and realize that outcomes are determined by a variety of factors. And just because an investment commitment has not worked out as anticipated, it does not necessarily mean it was an unwise commitment. Moreover, never over commit to any course of action where failure means you are wiped out. "...there is no asset which is so good that it can’t be overpriced." - Howard Marks (Source: The Tim Ferriss Show website). It is very easy to learn what is popular and possibly has done well market-wise...media generally focuses on such names. Some recent examples include Amazon, Netflix, and Apple. There is no disputing that these are dominant companies of our time. However, it is also important to realize that there is a price where even the mightiest companies do not make sense. Bitcoin investors discovered this in a very real way in 2018. So keep a wary eye on the current market darlings - they frequently do not remain on the top of the heap for forever. "...if you accept and inhale the unpredictability, variability, and randomness of the world, I think you’re likely to do a lot better in it." - Howard Marks (Source: The Tim Ferriss Show website). At any given time, there is obviously a whole lot going on in the world to consider. Due to the interplay of a multitude of factors, it is exceptionally difficult to predict what is going to happen next, particularly in stock markets. Some people fear this kind of unpredictability for one reason or another. Others, conversely, embrace this quality of our world and thrive. In Financial Planning for individuals, there is also much that is unknown - lifespan, unforeseen health concerns, family business changes, etc. It simply is impossible to predict how all financial situations will work out. I think the important takeaway from this quote is to accept the variabilities in our world while also attempting, as much as possible, to insulate ourselves from the bad outcomes. We can do this by not over-extending ourselves credit-wise, not undertaking risky investments that can jeopardize our financial well-being, and not ignoring sensitive issues like Long-Term Care planning simply because it is inconvenient. I could go on and on with other quotes from Mr. Marks' interview...these were just my favorites. All in all, I garnered much from this Podcast and I think you will too. Mr. Ferriss - as always - thoroughly prepared for his interview and asked thought-provoking and interesting questions. Moreover, he avoided all of what is bad about interviews today, which I think is a testament to why his Podcast is so wildly popular. Please invest the 2 or so hours to listen to it - it really is instructive and entertaining.